Hey, young bloods! 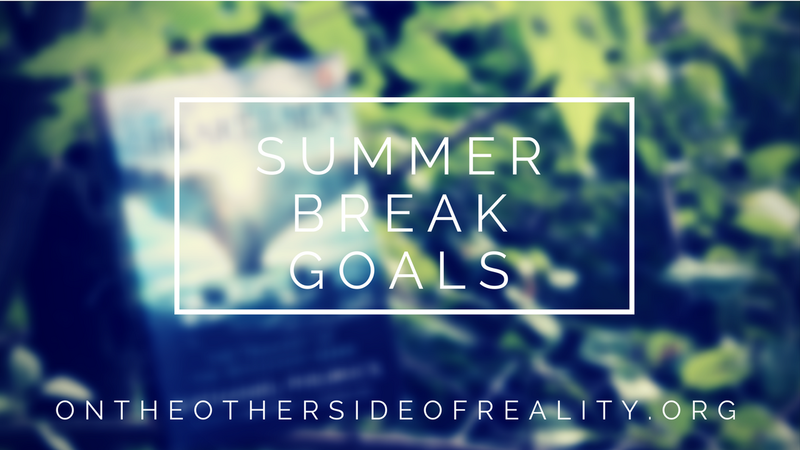 In order to kick off summer vacation, I have a bit of a different post for you today. I have very few concrete plans for this summer, such as work or vacations, so I'm setting a few productivity goals to keep myself occupied. What will I be up to this summer? - Finishing either Four Suns Falling OR The Spies Just Shy of Ordinary. In order to keep up with my writing to-do list, I want to finish one of two projects over the summer. Four Suns Falling is the first book in my high fantasy + assassins series, and The Spies Just Shy of Ordinary is the first installment in a novella spy series I'm currently plotting. Camp NaNo will be a huge help with this. - Making some money. I may or may not get a job, but regardless, I want to make a nice amount of cash this summer. - Getting at least 15 service hours. I'm trying for my school's service chord, which requires 210 service hours by May of senior year. In order to stay on track, I want to get 15 by the end of the summer. - Completing all my summer homework. This is less of a goal and more of a must, but I do fully intend to do it (obviously). I have summer assignments for APUSH, APLAC, AP European History, AP Bio, and Academic Decathlon, and I want to get them mostly finished by the start of August to avoid scrambling last minute. - Finishing at least three more anime. I'm headed to AnimeIowa this summer, and I'd like to finish a few more shows prior to that. I'm thinking Attack on Titan, Your Lie in April, and Anohana? We'll see. - Watching at least three movies. Since I so rarely watch movies, I have a weird goal of seeing twelve this year. In order to keep on track, I have to watch three this summer - I'm thinking Howl's Moving Castle, Pirates of the Caribbean: Dead Men Tell No Tales, and Guardians of the Galaxy, Vol. 2. Let's chat! What are your summer (or winter, if you live down under) plans? Have you seen Guardians, Pirates, or any other great films lately? Are you doing Camp NaNo? Comment below, and remember that you are all very beautiful pickles. Thank you! I absolutely don't :) YESSSSS, IKR. Ahhh, thank you again!! I've never done NaNo; is it difficult to get involved with? And good luck with all of your goals, especially the homework. Hope you have fun this summer! Ahhh, thanks!! I used Canva. First, I applied the "drama" filter to one of my old photos, then I blurred it by 62%. Then I added the writing (raleway font, with letter spacing) and box around the blog title! Oooh, I love your summer goals! As for what anime to watch, I'd suggest finishing Attack on Titan (although don't make the mistake that I did where I walked into anime club for the first time and saw the Titans taking each other out in the most gorey matter-- I almost threw up all the snacks I consumed that afternoon). The new season is bound to come out pretty soon, anyways! I CAN ALSO HELP WITH MOVIES AS WELL! I've seen all of the movies that you've mentioned and have watched them the past three months. Howl's Moving Castle is pretty good. If you compare it to all of the other Studio Ghibli films that weren't directed by Hayao Miyazaki, it's pretty fast paced. But, if you're watching it because you've read the original source material (initially a book), it does stray a ton from the book plot. Really random question: have you seen Princess Mononoke? That one is a bit more mature compared to the other kid friendly films but I think the tone would interest you. As for Guardians of the Galaxy: if you think that Groot is a smol bean and should be protected at all times, PREPARE TO BE HEARTBROKEN OVER THIS ONE SCENE. GAHHHH I can't say anything more than that. I preferred the original, but the sequel still does stand in it's own right. As for Pirates (I watched the two back to back day wise), hmm.... the new characters are kind of adorable in their own way, the cute babies of the characters we know. It feels a little strained in certain scenes and there's one plot line that kind of builds up and resolves itself a bit quickly, but compared to the fourth movie in the franchise, this one is loads better and flows better with the rest of what's already been established. I hope this helps, and I hope you achieve all of your summer goals! I'm kind of leaning towards that one? It's very popular, so there'd be lots of people at the con I could talk with about it. Ohh, thank you! I was planning on reading the book, but I might wait until after I finish the movie if it strays that much from the material. Have you read the book? I haven't seen Princess Mononoke, but one of my friends really loves it! OH NO AHHHHHH, NOT GROOT. THAT POOR CHILD HAS BEEN THROUGH ENOUGH. Yeah, the fourth one did feel very.....random? I enjoyed it, but it barely felt relevant to the other films. Wow, summer homework? That sounds like an oxymoron, and one that I would not be fond of hahah. Though I didn't take AP classes, my schedule was more like "well, that looks relatively uneventful and easy...". Your drive is impressive! I am the same with movies too- I NEVER watch them. I try to see 2 or 3 a year, and even that rarely happens. I think I just can't get that invested in such a short time? Idk! Your plans sound fabulous, I am sure you'll be able to achieve all your goals! I didn't think I'd enjoy it, but it's actually not that bad! I probably enjoy it because it's in subjects I enjoy. Thank you! The nearest cinema to my house is a half hour away, so it's quite a hassle to be able to go watch a film. Oooh I've yet to watch Guardians Of The Galaxy Vol 2 even though I've been meaning to for ages! Thanks for sharing and I hope you have a lovely summer break! IKR? Thank you, you too!